We’d love your help. Let us know what’s wrong with this preview of Hallows Haven by Melissa Brodsky. 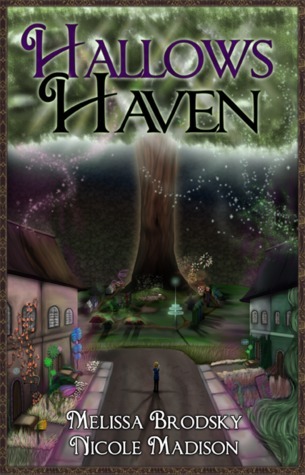 When strange things start to happen to Gwen, she is thrust into a magickal new realm called Hallows Haven. Leaving the ordinary behind, she d Captain of the cheerleading team, 16 year old Gwen Valiente has it all--the best of friends, a loving home, and a bright future. Little does she know that the people she loves the most have been keeping secrets--life-altering secrets. To ask other readers questions about Hallows Haven, please sign up. I was given the chance to beta read Melissa's & Nicole's YA Paranormal book and was happy that it turned out to be such a great debut novel. Both author's perfectly turned a well-known story into something totally new and gave the book the perfect mixture of magic, suspense, twists, and wth-effects; oh yeah there's sweet love story to find as well ;). I was hooked right at the very beginning of the story, due to the suspense they created - loved it. I was curious how Gwen's life will turn out in an unknown world full of magic; especially after forcing to leave her beloved friends and home behind. Hallows Haven creates a solid base and basic understanding for the following books in Melissa's & Nicole's series; with insides of Gwens family line and what happens after Gwen finds out about the family secrets,which were kept hidden,turning her life even more upside down. Who to trust/blame/believe and who not are constant questions in Gwen's mind. Be aware the book ends with a great wth moment and I wished I could have squeezed an answer out of both author's, finding out how it continues, because I'm hella curious,but I had no luck. So like you, I have to wait to read the second book. And like me, after reading THIS ending, you definitive want to know how it continues. I was honored to be given the opportunity to recently read/review the book Hallows Haven written by Melissa Brodsky and Nicole Madison. This book has been a refreshing change to the books I have been reading recently. The intertwining of magical and mythical people/creatures is truly amazing. I love how seamlessly it makes sense and fits together in the world of Hallows Haven. We learn about Gwen and her grandmother and their journey from Michigan to the secret underground world of Hallows Have I was honored to be given the opportunity to recently read/review the book Hallows Haven written by Melissa Brodsky and Nicole Madison. This book has been a refreshing change to the books I have been reading recently. The intertwining of magical and mythical people/creatures is truly amazing. I love how seamlessly it makes sense and fits together in the world of Hallows Haven. We learn about Gwen and her grandmother and their journey from Michigan to the secret underground world of Hallows Haven. Going through Gwen's life and learning things as she does in the story is such a wonderful way to let the everything unfold. I enjoyed getting to know Gwen and learning her family secrets (as you will see there are many) and as she settles into her new world full of magical powers. I beta read this book I loved it! my review was sent to the writer. cant wait to read book 2. I received an ARC of Hallows Haven for a honest review. This was a first time reading a book by Melissa Brodsky and Nicole Madison so I had no idea what I was in for. Wow, let me say what an Amazing book!! It absolutely blew me away. At first it was a little slow for me but by the middle of the book I just wanted to know more and had to keep reading. This book just pulled me in with all of the creativity and imagination that it had. I applaud these authors who wrote this book 4.5 Amazing Stars!! I applaud these authors who wrote this book. They came up with some very fascinating ideas and really allowed us readers to go into a new world altogether. This book is about a girl named Gwen who discovers that the life she has been living isn't what she thought. Her grandparents have been withholding secrets from her. Everything takes a huge turn and her life is suddenly no longer the same. She must move away to Hallows Haven and slowly learns secrets about herself, her parents and grandparents. Nothing is what it seemed in Gwens life and now she must become a completely while discovering that there are great dangers in the world around her that want her. What will happen in Hallows Haven is unpredictable but yet intriguing. The book itself was enjoyable and would probably have gotten a much higher rating from me, except for the fact that it ends abruptly in the middle of an action scene which is one of my biggest pet peeves with series writers. There was no sense of completion or resolution of a subplot at all. I really hate when series writers do that. I will not read book two. Hard to rate a book that I won and never received. Give one star just because they published a book. Will change review if I ever receive the book. I was looking forward to reading this book. Oh well.